We are seeing more and more of our clients choosing artificial sod/AstroTurf for their properties. Like everything else, AstroTurf has advantages and disadvantages. Have you ever wondered if this sod alternative is right for you? If so, keep reading, as we have put together a list of things you need to know. 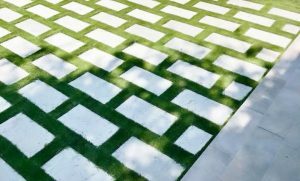 Pros and cons and why we think Synthetic Grass could be an option for you! The first thing you need to ask yourself is how much square footage you want to keep green. Secondly, what will the space be used for? We have found the biggest considerations are a direct result of these two answers. Decide if you want a large space or a small one, whether it will be used for children playing, sports, for aesthetic purposes, a dog run, or even to border a stone walkway. Now that you have these answers keep reading to see which option is best for you! Pricing varies from company to company! You can spend anywhere from $14-$18 per square foot installed. This is significantly more expensive than real sod which costs around $2 – $3 per a square foot installed. Astro-turf is certainly an investment, however, it is much more affordable if you have a smaller space. Some pro’s for a smaller landscape is not having to maintain grass around pool areas or stepping stones. Eliminating the need to mow, trim, sweep and irrigate a small area of greenery saves you time and money on your water bill. Let’s put it into perspective, If you are looking to sod an area that is approximately 2000 sq ft, artificial sod will run you about $30,000. No water bill can make up that difference, however, a smaller amount say 300 – 500 square feet can pay for itself by eliminating water, lawn mowers, weed whackers, aeration, and fertilizers. No maintenance, no irrigation systems, no stress and it’s always green! All seasons, sun, rain and snow. One of the most significant benefits of synthetic sod is that it withstands anything our Canadian weather sends our way. No mud or grass getting trailed into the swimming pool! No fading yellow patches and no dead grass over the winter months. Eliminating the carbon emissions from lawn mowers creates less pollution, no harmful pesticides are needed to keep your lawn green which is healthy for you and your family. Lastly, no water is required in order to maintain it. Therefore, if you live in an area where your water use is restricted, this option is a fantastic alternative for always having a perfect lawn. 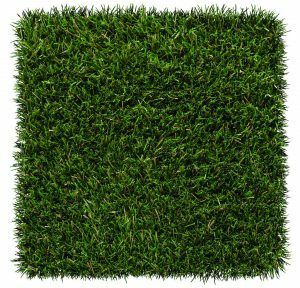 Now, on the other hand, synthetic sod is made of plastic, so it is not entirely green. Make sure you look into companies that use recycled plastic! 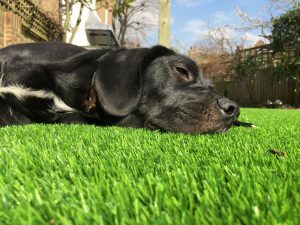 Synthetic sod is often used in dog daycares as it is straightforward to maintain, clean up and your puppies can’t dig up the ground. Imagine a life where you never have a dirty dog after letting them out back. So, if you have dogs running around at home, this could be the perfect option for you. Leave it to the professionals! There is a lot more that goes into laying synthetic sod then you may think. With novice installation, there is a lot that can go wrong. An uneven base, no drainage, ignoring the grain, incorrect base material, inaccurate measurements, not installing a weed blocker, and the list goes on. 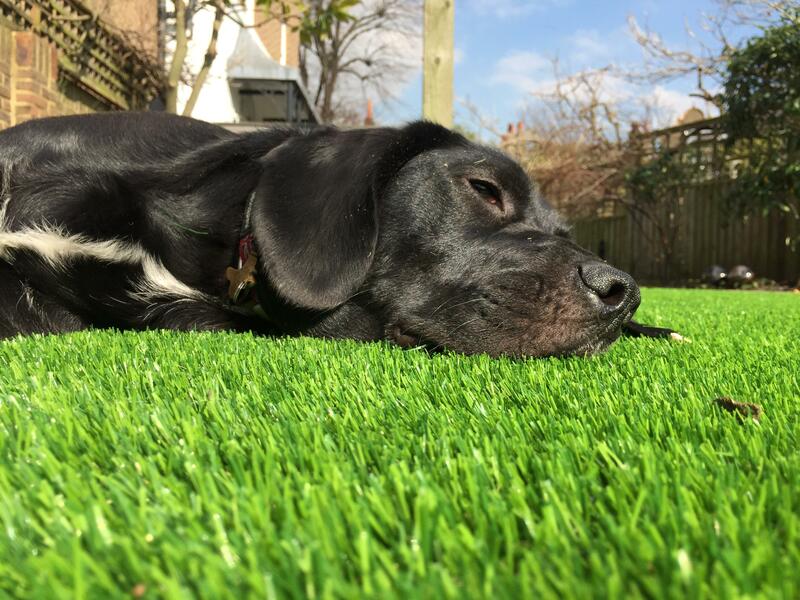 Trust us, if you want excellent artificial grass, ask for help. Synthetic sod is very hot to touch, which is why we would not recommend it for large play areas. It is a wonderful option for bordering pools, stepping stones, shaded/small dog runs, areas in your landscape that you want greenery for aesthetic purposes and not functionality. While AstroTurf has come a long way and higher end companies provide a look that is almost a replica of real sod, you can still see a difference. So know, if you plan on installing it in your front yard, it will look different from your neighbours. Synthetic sod is not entirely maintenance free! You still have to rake leaves and debris that falls. You will also have to brush the blades themselves, to prevent the turf from compacting down over time. Synthetic sod can last anywhere from 10-25 years! This is one major selling point. Design!! 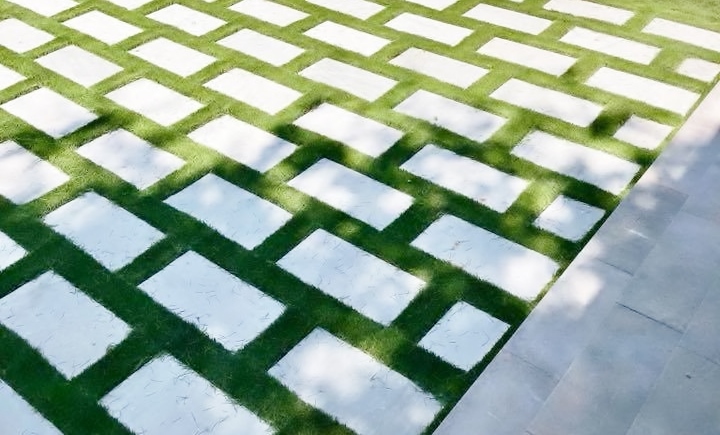 Use synthetic sod to create a unique modern design. By cutting in stepping stones, you can devise a creative space like no one else. Don’t hesitate to call us at 905.338.1433 if you have any questions! Or for a quote, if you think synthetic sod is the choice for you!